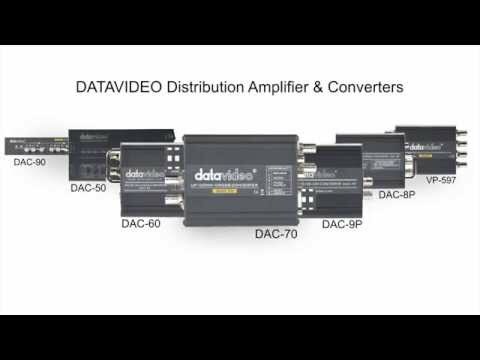 Product Overview The DAC-8P is small and intelligent converter for converting HD & SD-SDI to HDMI. In combination with Datavideo's DAC-9P, HDMI to HD/SD-SDI converter, system installers now have a perfect and very affordable solution for distribution HDMI over long distances, without compromising on quality. Features • Input: 1 x SDI, 1 x unbalanced audio. • Output: 1 x HDMI, 1 x SDI (loop through). • Use LCD / Plasma TVs and projectors for broadcast video monitoring. • SDI embedded audio is passed through. • Wide range DC input from 9V to 15V. • Video output format is the same as the input format, so "what goes in, comes out".